Posted on Fri, Feb 24, 2012 : 11:15 p.m.
Huron's Devin Talley, right, shoots over Chelsea's Katelyn Kingsley. Talley scored a season-high 26 points on the night. The Chelsea girls basketball team is a very good Class B team, ranked No. 9 in the state. Huron is a very good Class A team. That much was clear after Southeastern Conference Red Division champion Huron shot the lights out in a 76-50 win over the SEC White champion Bulldogs in a cross-divisional showdown at Chelsea High School on Friday night. Devin Talley led the way for the River Rats with a season-high 26 points despite not playing in the fourth quarter after turning an ankle. Talley missed practice Thursday due to a family engagement and didn’t expect to shoot the ball well. She ended up making 9 of 16 attempts from the floor, including 6-of-9 from 3-point range. Huron (15-5) hit 11 3-pointers on the night. Talley wasn’t the only one in the zone as Huron went 9-of-12 (75 percent) from the floor in the first quarter and was a perfect 3-of-3 from 3-point range as it built a 22-12 lead. 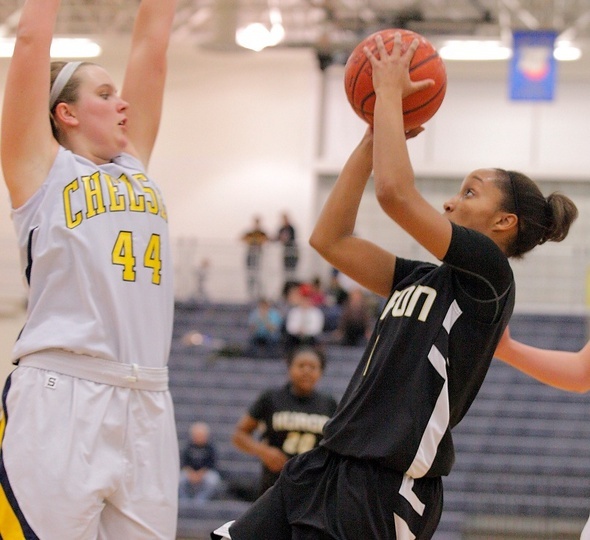 Chelsea also shot the ball well (6-of-10) in the first, but couldn't keep pace with Huron in the early goings. Huron cooled down a bit in the second quarter, except for Talley. She scored 12 points in the frame, including a pair of 3-pointers. After Huron stretched the lead to as many as 14 points, a 9-0 Chelsea run narrowed the River Rats' lead to 30-25. Huron made 3-of-4 3-pointers to end the quarter and took a 39-29 lead into the half. Talley hit three more 3-pointers to start the third and Chelsea never came within single digits of the lead again. "They were scoring just as many baskets, but they were hitting twos,” said Vinson. Chelsea coach Todd Blomquist liked the way his team played, save for a lack of rebounding in the second half when Huron finally started missing some shots. He couldn’t help but laugh at Huron’s 28-of-58 (47.3 percent) night from the field and 11-of-22 (50 percent) night from beyond the arc. It is just Chelsea’s second loss of the season, but Blomquist thinks his team is better for it. “There’s no question it made us better for next week and beyond,” Blomquist said. Grace Martin led Chelsea (18-2) with 14 points. Sat, Feb 25, 2012 : 2:02 p.m.
Can anyone please tell me why AA Huron Girls basketball is allowed to have 4 players from out of district on their team? It is widely known by coaches throughout the area that this is true. Check the rosters from previous years and compare. Where do the top players come from? Food for thought.